This was my bicycle touring gear list for cycling from Greece to England. It was a three month cycling tour on mainly sealed roads through Europe. Read on to find out more. Before I start with this bicycle touring gear list, here's a shout-out to all you ultra-light bicycle touring enthusiasts. Yes, I know you probably cycled from the Arctic to Antarctica carrying only a toothbrush, one spoke, and a spare pair of underpants. You are awesome! So kindly refrain from saying that this gear list is ‘too heavy'. You didn't have to cart it around anyway!! With that said, if anyone has positive contributions to make, (especially in regards to anything you think I may have forgotten), please leave them below. Cheers! A brief bit of background before I detail the bicycle touring gear list. I have completed a few long distance cycle rides in the past, (England to South Africa, Alaska to Argentina). Much of what I had chosen to take with me was based on these past experiences, and knowledge of what I might need. There was also another important factor that I had to take into consideration, which was that I needed to work during this cycle trip. Hence the abundance of tech gear. Still, with all that in mind, the bags weighed in at around 22kgs, which isn't ‘too bad'. Actually, if you want to know exactly how much they weighed, watch the video below. In the video, I also go more in-depth about the bicycle touring gear, and why I have chosen it. I've broken down the bike touring kit I used for this trip into different sections below. I think this includes 99% of the gear I took with me on the bike tour across Europe. I also made copies of all my documents such as passport, credit cards, and International Health Insurance, and stored the details online in Evernote. I used a Stanforth Kibo+ bicycle for the cycling trip from Greece to England. The bike was kindly loaned to me by Simon Stanforth so that I can test it out on the road. I have written a brief review about the bike which you can find here – Kibo+.You can also check out the short video I made about the bike below. If you have time, check out my YouTube channel for the post trip review. Very few people make a video of their expedition bicycles after a trip, which again, you might appreciate. Ortlieb Back Roller Classic – These are almost standard issue for bicycle touring. Well designed, well made and long lasting, I wouldn't tour with anything else. I have 2 rear panniers and 2 front panniers. Ortleib Rack Pack – The Ortleib Rack Pack is designed to sit on top of the 2 rear panniers, and straps securely on to them. This extra storage space will get used for my tent and cooking gear. Ortleib 5 Handlebar bag – Not the best handlebar bag in the world. I think I got it free from somewhere. Is it even waterproof? I will soon find out, no doubt! 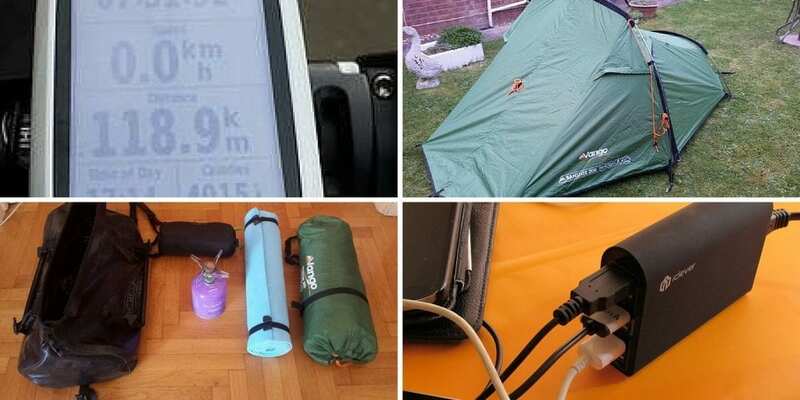 Bike Pump – No bicycle touring gear list would be complete without mentioning the bike pump! As I have grown older and wiser, I have realised the importance of having the correct tyre pressure, and so I have opted for the Topeak Mini Dual DXG pump with pressure gauge. Read about the review here – Topeak Mini Dual DXG Review. Bike lock – I have an OnGuard bike lock for times when I need to lock the bike to something, and go for a wander. Spare Inner Tube – just the one tube needed for this trip at the moment. No doubt I will buy more along the way. Alien 2 Multi-Tool – A good general purpose multi-tool. During this trip, I doubt I will need anything more complex than this, as I will be rarely more than a days ride away from a bicycle shop. (Although watch this space!!). 3 tyre levers – They are going to get some use I think! 1 pair of veltuff gloves – To keep my hands clean when tinkering with the chain. Sandwiches taste a lot better without chain oil all over them! 9 spare spokes – Just in case! Rear cassette removal tool – If I do break a spoke, you can bet it will be on the back wheel! Check out the video below for the full bicycle touring tool kit I am taking with me to cycle from Greece to England. I camped about 50% of the time during this cycling trip from Greece to England. This is the camping gear I used on the way. Camping also necessitates a cooking kit. I was all set to bring my MSR Whisperlite Universal on this trip, but I noticed at the last minute that it was faulty. In the end I took a Camping Gaz type stove. During the last month of the trip, I didn't use it at all. this is not the first time I have not used a camping stove on a long distance cycling trip. Perhaps I will write a fuller article about if a camping stove is neccessary for bicycle touring. I normally carry about 2 day's food in my panniers when bicycle touring. 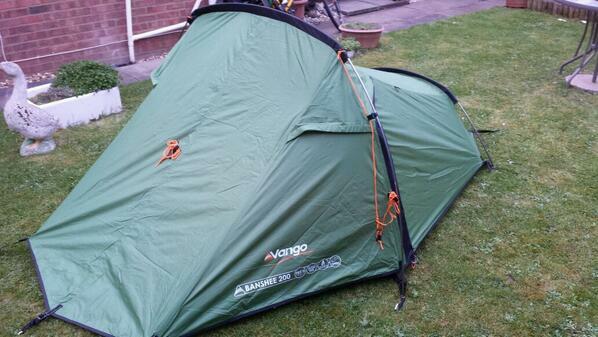 This gives me the flexibility to wild camp when I choose, and means I always have extra to eat if I want it! Bicycle touring makes you hungry! The list of what I am actually leaving the apartment with is below. Why these foods? You can read up here about the best foods for bicycle touring. Brew kit comprising of tea, sugar and coffee. I have various leads, chargers, and odds and ends I am going to take with me. 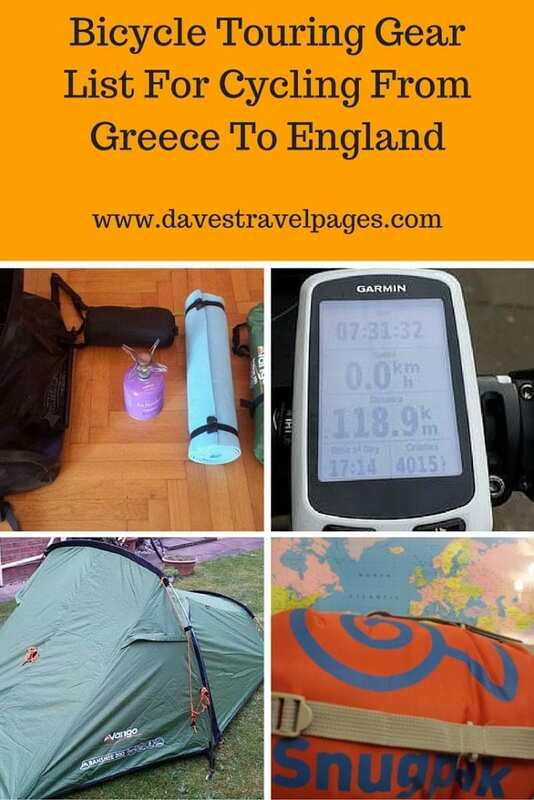 You can check the bicycle touring gear list for cycling from Greece to England video for more details. The main items are listed below. 2 x Power Banks (reserve batteries for tech gear). Check the Tecknet Iep1500 Power Bank. During the trip, I found all the items on this bicycle touring gear list to be useful. On some trips, I end up ditching some items as they are too heavy. On this occasion though, I had it just right. What gear do you take when bicycle touring? I would love to hear from you, so please leave a comment below! Bike Touring Essentials – My top 10 cycle touring essentials that I would never leave home without! Disagreement or debate on equipment isn’t negative. It’s, for many, informative. My back up cell for phone, garmin, e.t.c. is solar powered, you might consider, mine is fromm Lava X storm, two years old now, often used and still very good. I think that solar charging or dynamo hubs are my next step. I hope to test some out either this year or next. I hope you enjoy Kosovo! I was there a couple of months ago, in two feet of snow… although not on the bike thankfully! Perhaps I will catch up with you en-route somewhere… Slovenia sounds good!! I have done a bit of touring myself and you have a great list. Word of advise though. I found the chain spliter on the Alien 2 to be not very good on the road. Can you get a dynohub on the bike, with all that tech, they will lose power very quickly unless managed very closely. Also a great thing to have instead of shower gel, soaps and the likes is to get a multi purpose washing detergent that will wash you and your clothes. Don’t bother with a razor, but get some sunscreen. Swap the trainer for crocs. They look horrible, but great when really hot and can be used on and off the bike. I would use my cycling shorts as swimming trucks. The best thing I always take on tour, which are massively under rated are my waterproof socks. If you are going in summer, I wouldn’t take any waterproof stuff other than sock and jacket, depending on how you normally cycle. I don’t mind getting wet at all, but really dislike getting cold and wet. This is just my humble opinion for experience. If you have never done a long tour before, the first couple of weeks are hell, and really tough. After that, your body and mind has adjusted and it great fun that you will never want it to end. Good luck and enjoy the life changing experience. Thanks for the tips! I’ve done a few tours before, and am REALLY looking forward to that painful first two week period haha. I tested out the chain splitter (admittedly a year or two ago now), in a comparison test with my regular splitter, and found them to be pretty much equal, although more care was needed when using the Alien in order to get everything lined up correctly. I’ve not gone the crocs route before, but will have to give them a try at some point – maybe next tour! And yep, waterproof socks are by far the best! My sealskinz keep my feet nice an toasty even in the coldest, wettest weather!! I’m in central Turkey just now, so I might just see you on the road. As for the tyres – i have always toured with Schwalbes. For the start of this trip though, i am going to set out on Halo’s and see how they perform. I’m probably asking for trouble, but you have to try something different every now and again! Aome friends had issues with their msr stove too. They.wrote.to msr who sent them new stuff. Might be worth a try. Thanks for that Philip – I may give it a try! I think I am to blame in this case though. The fuel pipe has been bent out of shape due too it being moved around so much. Not really keen on buying another one, so I will stick with Camping Gaz for the time being! One pair of underwear… eeeeek! Good luck on your trip. Hope you enjoy good weather and a constant tail wind. When you weighed you kit in the video, did you weigh the camera each time you got on the scales? Very good point! Yes I did weigh the camera on each trip to the scales, but never weighed it by itself. An extra 300g ! !